The NASCAR Xfinity Series team co-owned by Dale Earnhardt Jr. recently announced a shuffling of the numbers on its cars and the introduction of the No. 8 to the team. Earnhardt formerly raced the No. 8 in the NASCAR Cup Series, and the number’s significance to the Earnhardt family goes back to Earnhardt’s grandfather, Ralph Earnhardt. In its announcement of number changes, JRM also released a driver schedule for the No. 8 team. Driving duties will be shared by Spencer Gallagher, Ryan Preece, Zane Smith, Ryan Truex and Jeb Burton. Gallagher announced his retirement from full-time competition as an Xfinity Series driver in 2018, transitioning into an administrative role with his family-owned GMS Racing. He is slated to drive the JRM No. 8, though, for the Xfinity Series’ three restrictor-plate races at Daytona (Fla.) International Speedway and Talladega Superspeedway. As a result, he’ll be the first driver in the car for the season-opening race at Daytona on Feb. 16. The series heads to Talladega on April 27 and returns to Daytona on July 5. 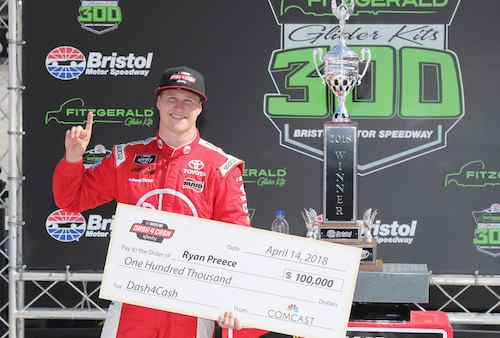 Preece, who will be racing full-time in the Monster Energy NASCAR Cup Series for JTG-Daugherty Racing this year, will drive the No. 8 Xfinity Series entry for four races — Atlanta Motor Speedway on Feb. 23; Auto Club Speedway in Fontana, Calif., on March 16; Pocono Raceway in Long Pond, Pa., on June 1; and at Watkins Glen (N.Y.) International on Aug. 3. Smith will make his Xfinity Series debut in his first turn behind the wheel of the No. 8 at Las Vegas Motor Speedway on March 2. He’ll also drive the car at Bristol (Tenn.) Motor Speedway on April 6, at Richmond (Va.) Raceway on April 12 and Sept. 20, Dover (Del.) International Speedway on May 4 and Oct. 5 and Iowa Speedway in Newton on June 16 and July 27. Truex, who raced full-time in the series for Kaulig Racing last year and will run a partial schedule for Tommy Baldwin Racing in the Cup Series this season, will drive the No. 8 in four races in 2019 — at ISM (formerly Phoenix International) Raceway on March 9, Las Vegas Motor Speedway on Sept. 14, Charlotte (N.C.) Motor Speedway on Sept. 28 and Kansas Speedway on Oct. 19. Jeb Burton is slated to drive the car at Texas Motor Speedway on March 30 and Nov. 2, Charlotte Motor Speedway on May 25, Chicagoland Speedway on June 29, and Homestead-Miami Speedway on Nov. 16. All five drivers will have Taylor Moyer atop the No. 8 pit box as crew chief.